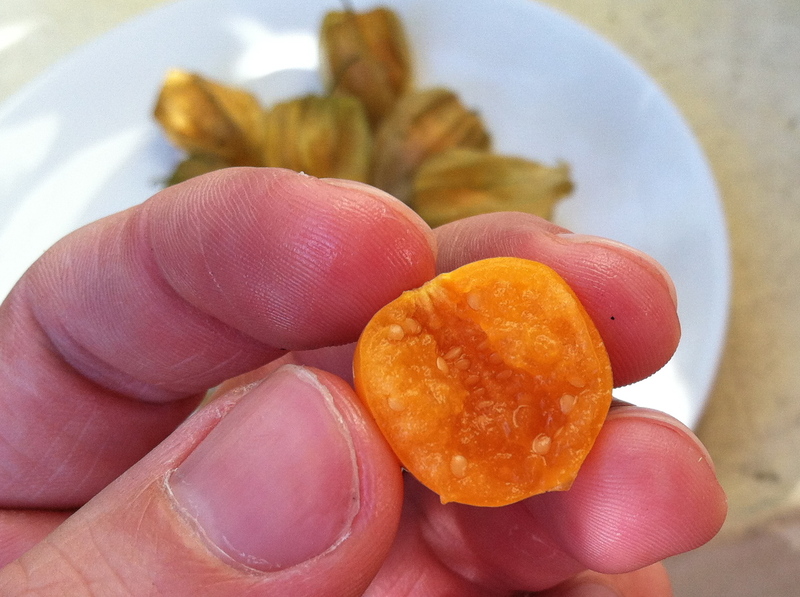 Goodbye, Cape Gooseberries | Keep It Up, David! The title of this post is actually a list. I’m not saying goodbye to gooseberries, I’m listing the two topics I’m going to be writing about. Aren’t you glad I cleared that up? I am. Goodbye. I said goodbye to one of my best friends this weekend. Tavi – the same Tavi that gave me my awesome new haircut, took me to my first yoga class, and came with me to my plastic surgery consultation – is gone. He and his boyfriend Antonio are both aerialists, and they booked a gig in a circus show that’s bring performed on a cruise ship. So, for the next seven months, they’re going to be cruising up and down the Pacific coast, from Alaska to Colombia, flipping and swinging and twirling the whole way. Tavi is the third extremely close friend that has abandoned LA for international travels. Katherine moved to Sweden almost three years ago (holy crap, has it already been three years? ), and last fall, Jen moved to Germany to go back to school. And now Tavi. I’d be lying if I said I wasn’t bummed, because I am. I miss Katherine and Jen like crazy, and I’ll miss Tavi, too. He’ll be back, in November, but that’s a long ways away. I’m not worried about our friendship. We’ll always be friends, no matter where our travels take us (same goes for Katherine and Jen). But I so enjoy the time I spent with Tavi, because among lots of other things, I like the way I feel about myself when I’m with him. I like knowing that no matter how I’m feeling, whether it’s depressed or stressed or anxious, I’ll feel better if he’s around. That’s the sign of a true, great friend. I’m happy for Tavi and Antonio and the opportunities this job will provide. But, at the same time… is it November yet? 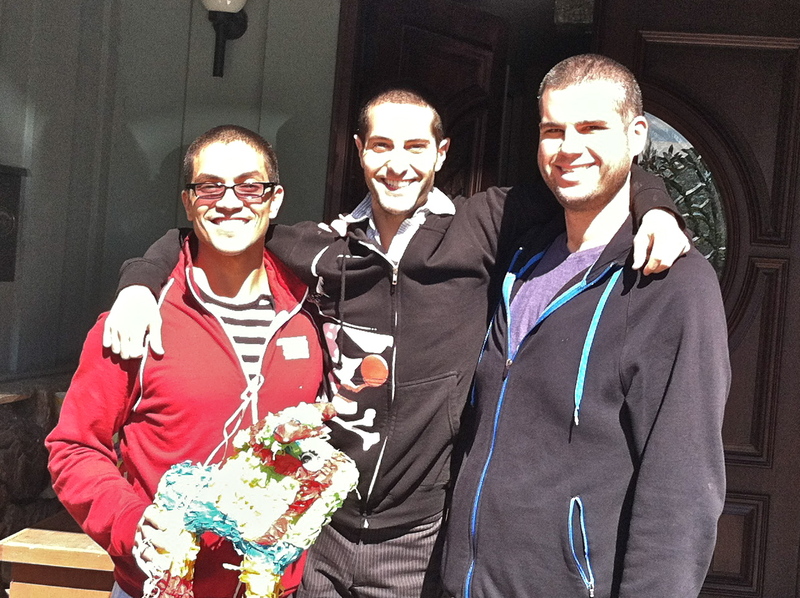 I took Tavi and Antonio to the airport the other morning, and when I got to Tavi’s house, I got a fun surprise… both he and Antonio buzzed their heads! Look, we’re triplets! 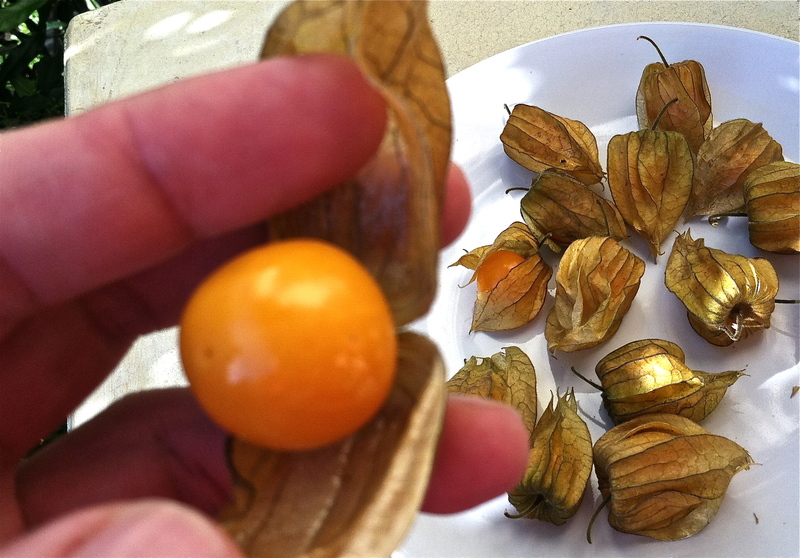 Cape Gooseberries. I recently stumbled across a variety of fruit that I totally thought was fictional! I’ve heard of gooseberries before, but thought they were made up by Dr. Seuss or Roald Dahl, like snozberries. Nope – they’re real, and I bought a carton! 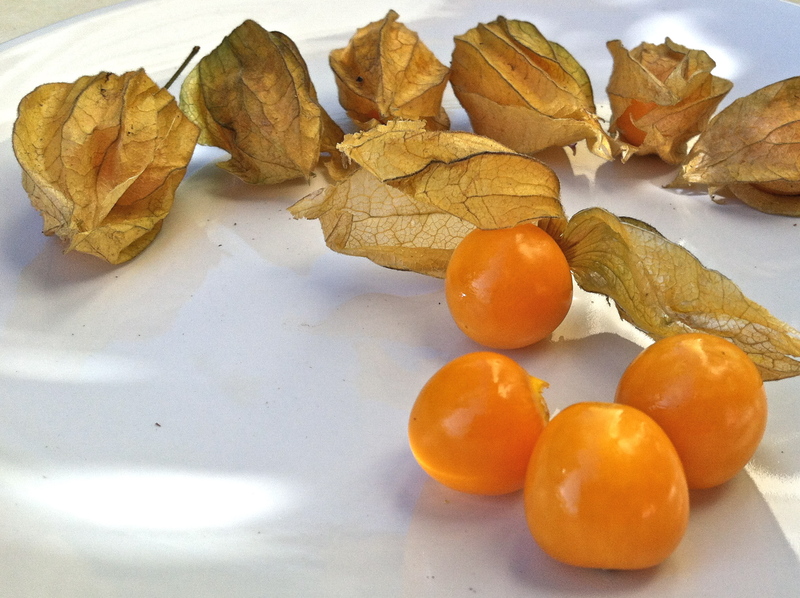 There are different types of gooseberries, and cape gooseberries are native to South America. They’ve been grown in South Africa for over 200 years, and the ‘cape’ in their name is in reference to the Cape of Good Hope. They’re closely related to tomatillos, which are popular in Mexican and Latin American cooking, and both tomatillos and cape gooseberries are members of the nightshade family, which also include eggplants, tomatoes, potatoes, and the pepinos I tried last week. 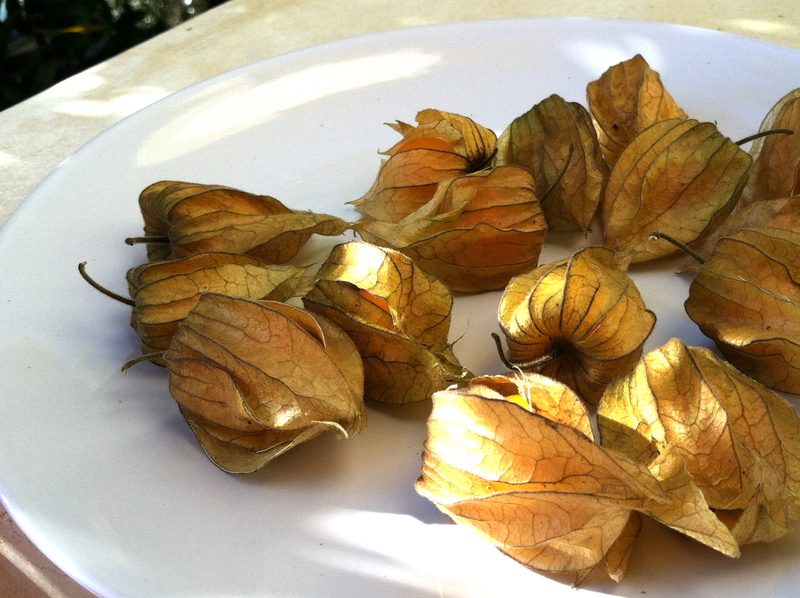 Cape gooseberries are a good source of vitamin C and fiber. They’re dense little berries – more of a bite than a blueberry or a grape, and with an interesting flavor – a little like a cherry tomato mixed with pineapple or mango. Some berries were a little bitter, but most of them were nicely sweet. There a lot of gooseberry recipes online – for jams and desserts – but these are pricey little buggers! I paid $5 for that container, which had 15 berries in it, so they’re 33 cents apiece. At that price, I’d much rather just munch on them! This entry was posted on Monday, April 16th, 2012 at 12:44 am and is filed under Uncategorized. You can follow any responses to this entry through the RSS 2.0 feed. You can leave a response, or trackback from your own site. 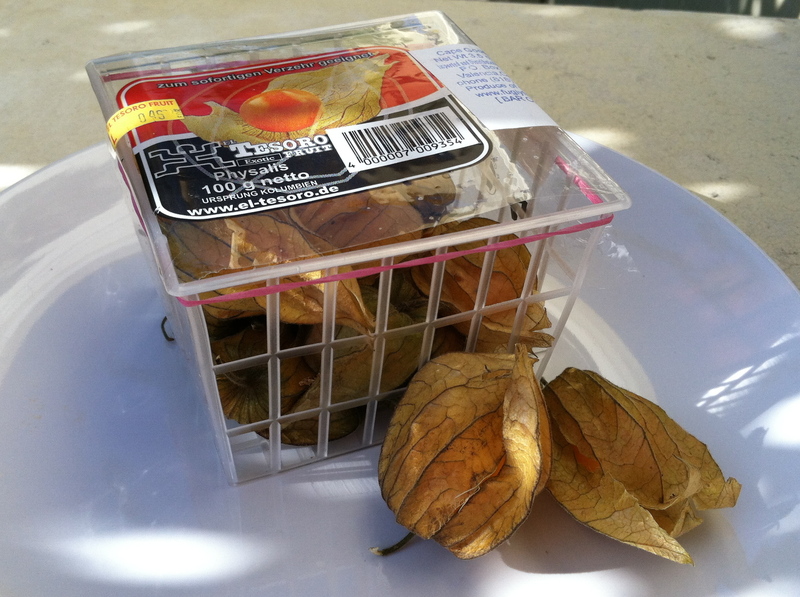 I should have been more specific from the get-go… they’re cape gooseberries, which are another name for physalis. But I’ve been looking at pictures of gooseberries, and I’m intrigued by them. A hairy berry? Sign me up! I’ll keep my eyes open for them! Now that I read ‘cape gooseberries’ I rembember that I once herad somebody call them ‘Kapstachelbeeren’ in German which literally translates as cape gooseberries. 🙂 I love learning new words. Gooseberries are great, we used to have a big bush of them in the garden – I made lots of jam and even tried a Gooseberry Fool recipe out of Nanny Ogg’s Cookbook. My children couldn’t get enough of it. I just edited the post to clarify. Thanks for the heads up! David, Where do you shop? You find some interesting fruits and veggies. Things I’ve never seen in the produce section. Cheers! These cape gooseberries came from Whole Foods, although the pepinos I wrote about last week came from the farmers’ market. I’ve also been, in the past week, to a market called Sprouts – I love switching it up! Think you might be thinking of snozberries which are in rhoal dahl’s Charlie and the chocolate factory. I like the green gooseberries! Hi i was online looking for information about cape gooseberry, and I found your blog, my name its Carlos Fajardo i am the owner of the El Tesoro Fruit, company whichs exports to the States that fruit, It makes me very happy to find you like it, they are selling it very expensive do.